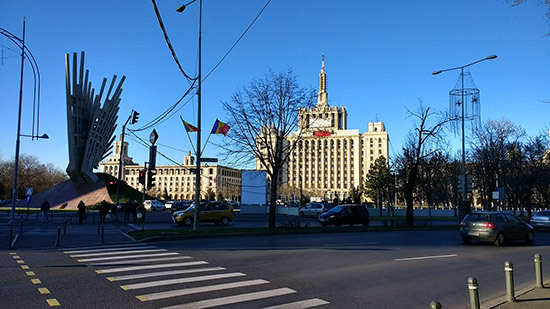 Location: Beraria H, Șoseaua Kiseleff, Bucharest, Romania. 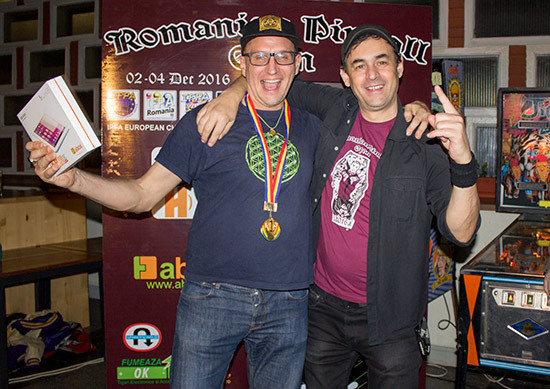 We had been invited to attend the Romanian Pinball Open several times by the organisers Ovi and Gabby. 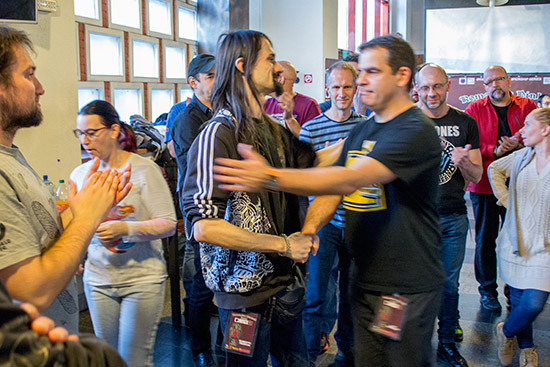 Eventually, and despite the dates clashing with another more local tournament, we yielded, booked the flights and accommodation, and packed our bags for Bucharest. The venue for the tournament was in the north of the capital in a building called Beraria H. It is built on the edge of a reservoir and is close to one of Bucharest's many iconic buildings - in this case the House of Free Press. The Beraria H building is one of many from the Ceaușescu era which produced a lot of impressive but not necessarily very attractive structures. Beraria H began as an exhibition centre to promote the best of Romania's products, then briefly became a shopping centre before folding and being turned into an entertainment centre. It promotes itself as the biggest beer hall in Eastern Europe, but it's far more than just a drinking den. Craft and collectable stalls occupy the entrance on the upper level and the far end of the hall on the lower floor. 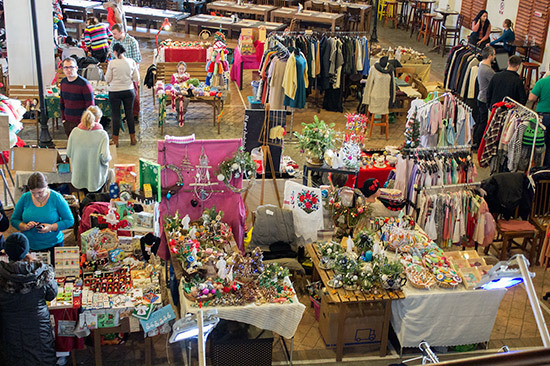 In between are masses of tables arranged around a central stage. Plenty of beers are available as a pretty reasonable menu offers an interesting selection of meaty products at reasonable prices. 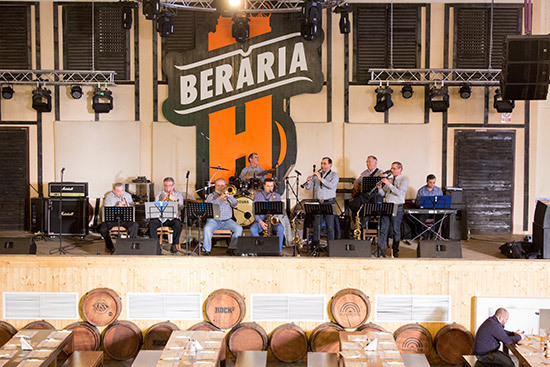 Beraria is also a concert venue and live music is performed here throughout the weekends and during the evenings on weekdays. 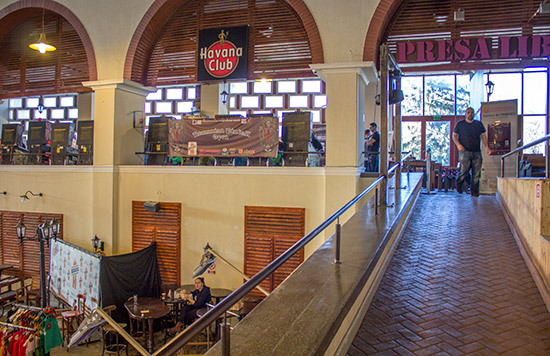 Although it looks empty in these pictures, it becomes absolutely packed with upwards of 2,000 patrons in the evening. 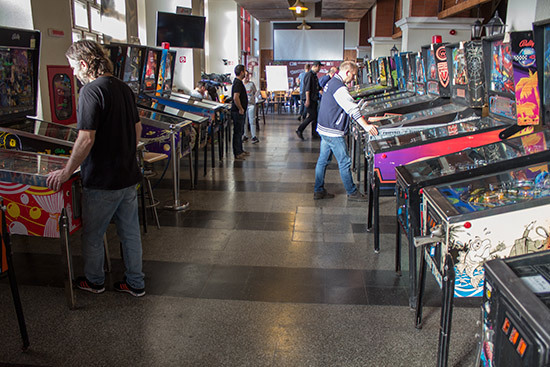 So competitors in the Romanian Pinball Open (RPO) don't have to go far for food and drinks, which is just as well as there aren't many other establishments around. The Hard Rock Cafe is in the same complex, but that's about it. 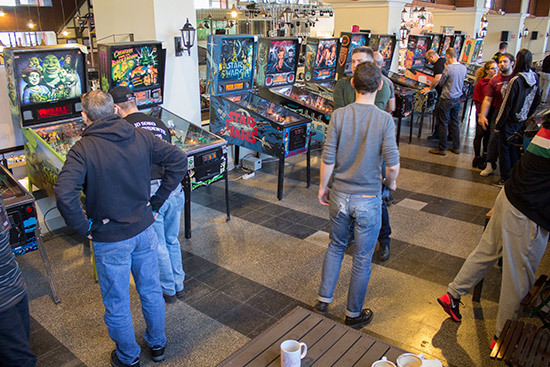 The pinball tournaments were held on the upper level at the far end of Beraria H, overlooking the craft stalls. This kept them away from most casual visitors and helped to reduce (slightly) the impact of the noise from bands playing on the stage. The machines were arranged either side of a section of a long corridor which ran almost the entire length of the building. 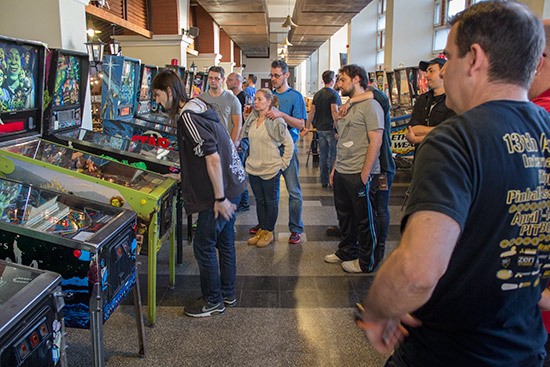 Modern machines used for the RPO and Pingolf Tournaments were on one side overlooking the hall, the remaining modern machines were joined on the opposite side by the '80s Tournament machines. 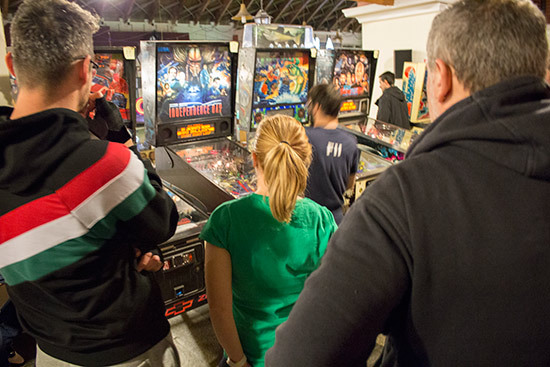 The tournament desk was at the far end, and next to that were a few extra pinball and video games. 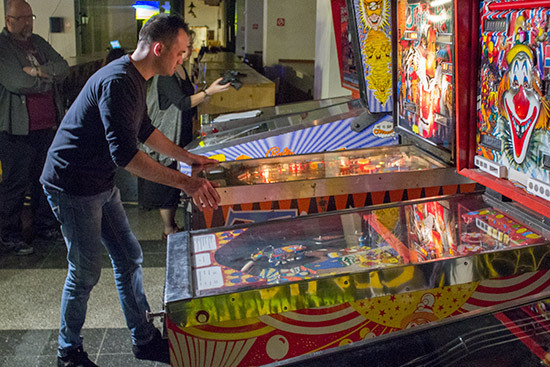 The pinballs didn't seem to be fully working and the video games were on pay-to-play, so we didn't check those out. 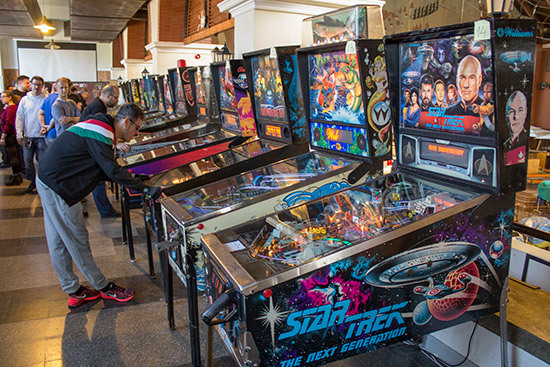 Qualifying for the RPO began on Friday evening. 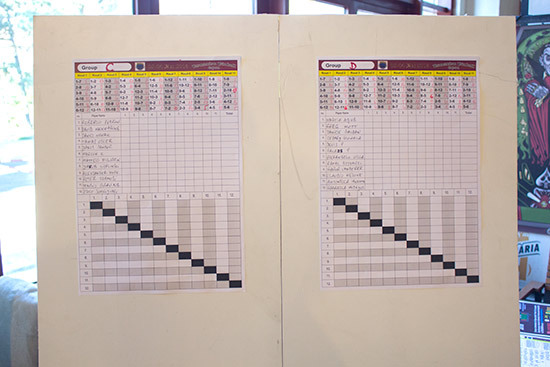 Twenty-four players were put into two groups of twelve and set to play one game against each of the other eleven players in their group. 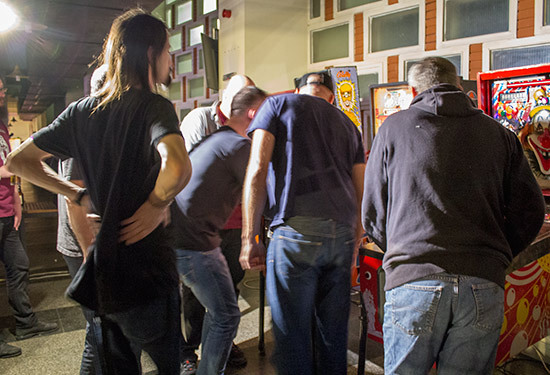 The order of competitors and machines played were pre-selected, with play order in each match decided by the toss of a coin. 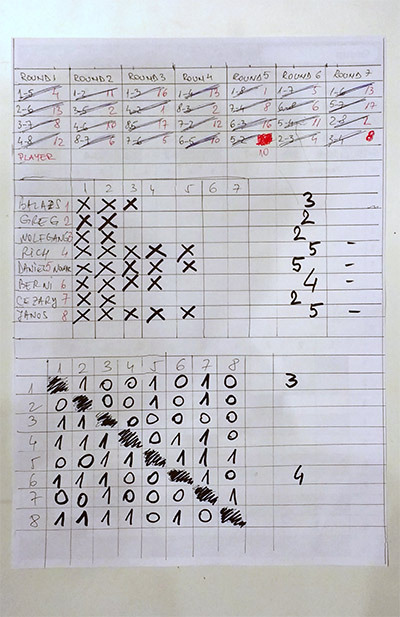 Winning a game was the important thing, and each win was recorded against the player's name on the score chart. Once all eleven rounds had been played, the six players with the most wins moved on to the next round which would be played later on Saturday once that day's qualifying rounds were over. 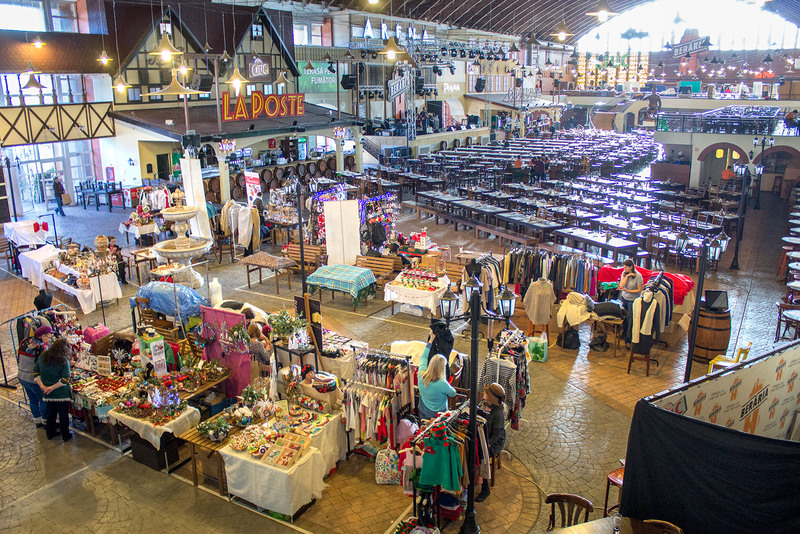 We opted to save our energy for the following day, and instead headed for Old Town to see what culinary delights the city had to offer. 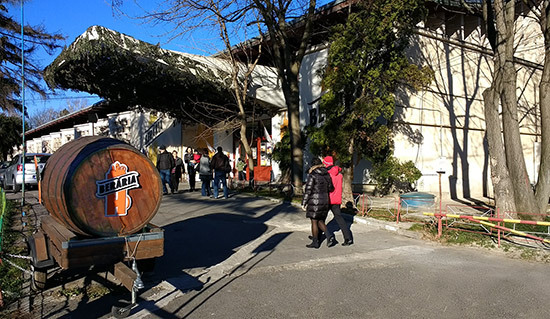 After an enjoyable meal we wound up at a bar called Beer O'clock which presented us with the opportunity to try a true rarity - what was, when it was launched in 2011, the world's strongest beer. 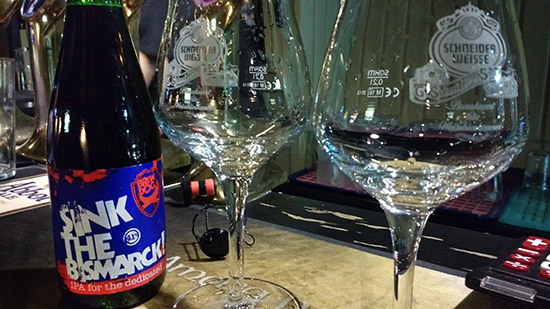 Brewed in Scotland by Brewdog, it cost £55 ($68/€65) for a 330ml bottle, and was Brewdog's effort to recapture the title of the world's strongest beer after a German brewery claimed victory with their 40% beer. It's almost impossible to find now. 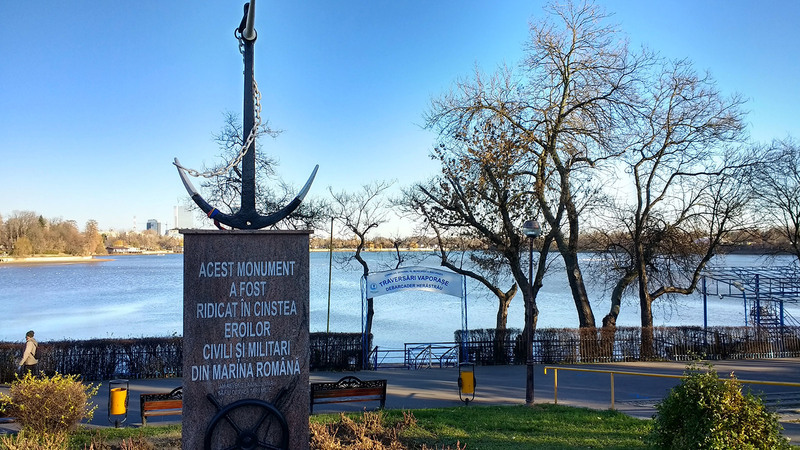 Who thought we'd find it here in Bucharest? 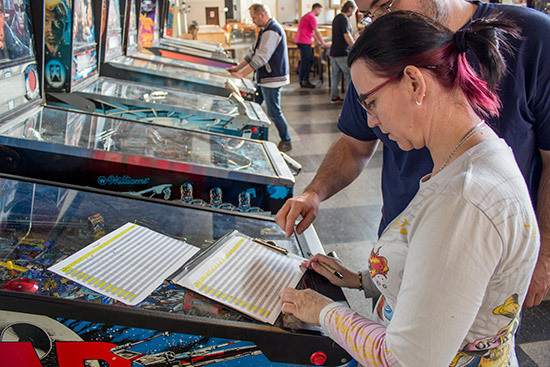 Saturday's pinball action began at 10am with another twenty-four players competing just like their Friday night counterparts. 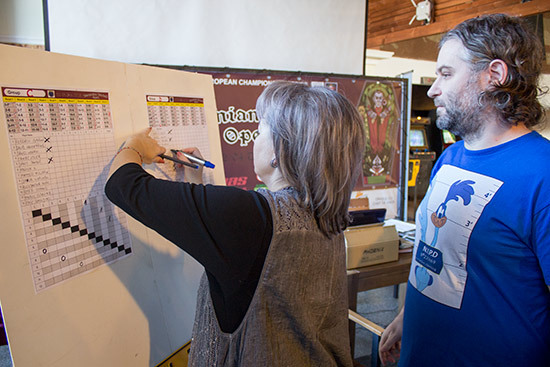 When the all the qualifying rounds were over, the twenty four qualifiers were again split into two groups of twelve and played the same format again. 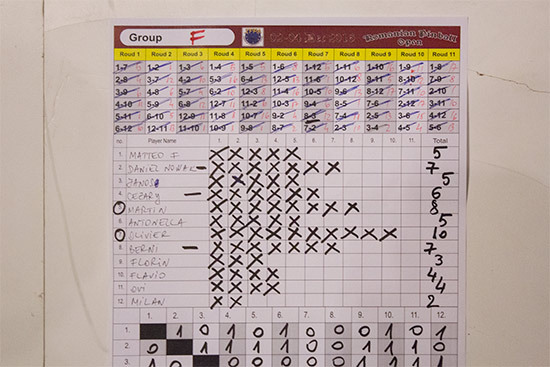 As before, the six players with the most wins moved on to the next round, except this time the top two in each group (circled below) received a bye through to the quarter-finals. That left eight players competing in the third round of play-offs. They played the same format as before, only this time in a single group playing seven single-game matches. The four with the most wins then continued to meet the four players with byes in the quarter-final round. 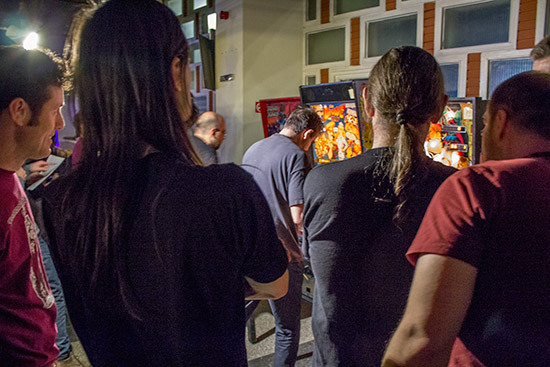 The original plan was for all the games to be completed by 9pm, because that was the time the band would start playing on the main stage which would be so loud it would be impossible to concentrate on the games.. However, the matches continued long past that time, with the music blasting away regardless. There was even an unsubstantiated suggestion that reverberations from the bass caused a game to tilt, but the players just continued anyway. 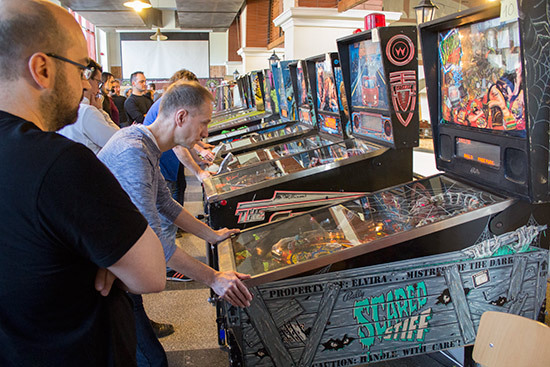 The last eight were paired up to play best-of-three head-to-head matches on a single machine, with the winner progressing and the loser dropping out. 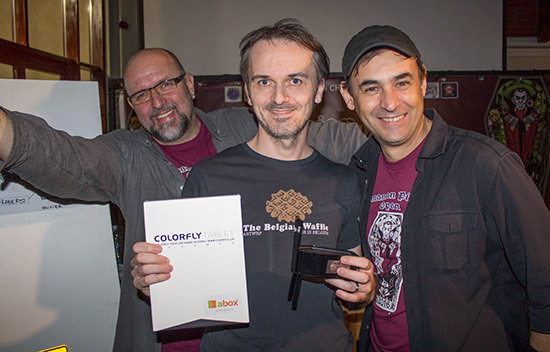 Berndt Ion Teodorescu played Olivier Francq, Rich Mallett played Martin Ayub, Bogdan Constantin Ghiga played Daniel Nowak, and János Sándor played Roberto Pedroni. From those matches, Olivier, Martin, Bogdan and Roberto went into the semi-finals which were played in the same way. 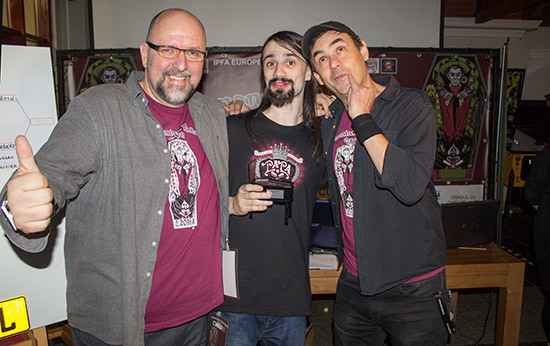 Martin and Roberto emerged victorious from those to contest the final which was another best-of-three played on Scared Stiff. Just to add to the interest, the venue decided to switch off the lights, so Ovi found a portable spot lamp which he held to illuminate the game. The sound was also cranked up to try to overcome the band's performance. 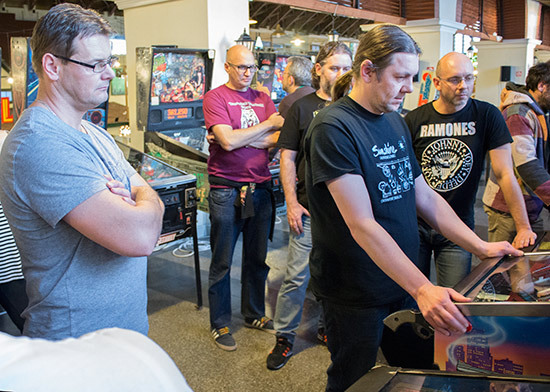 The first game was a very cagey affair with neither player gaining control of the machine. It finished with Martin narrowly ahead with 1.8M to 1.6M. 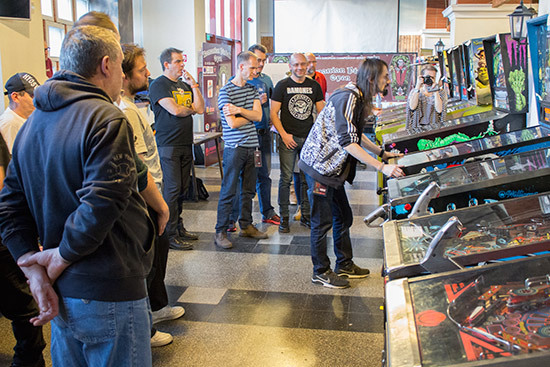 The second game was a little better with both players starting crate multiball, but Martin also got Coffin multiball going and that proved to be the game and match decider. 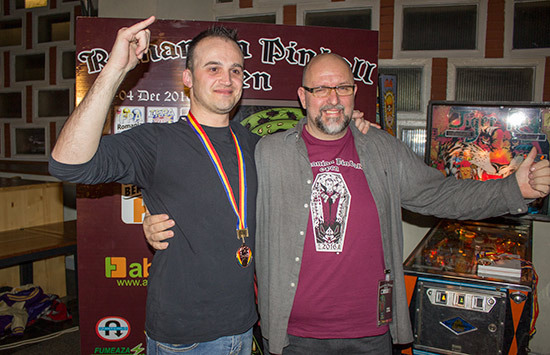 With a 2-0 score, Martin had won the final. 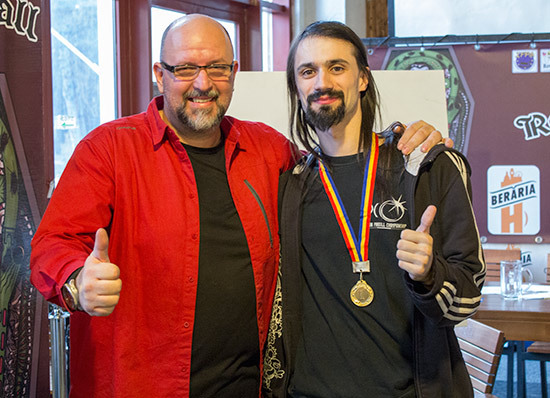 Roberto was second, and in a separate play-off Olivier beat Bogdan to take third. 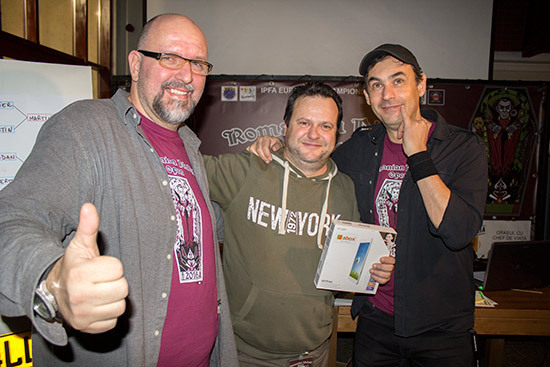 The presentation of prizes and trophies then took place. 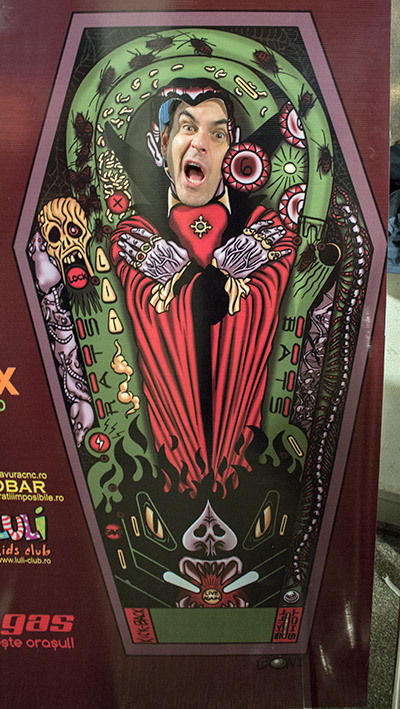 Each of the top four won an Android tablet while the top three received a custom coffin-shaped pinball trophy. 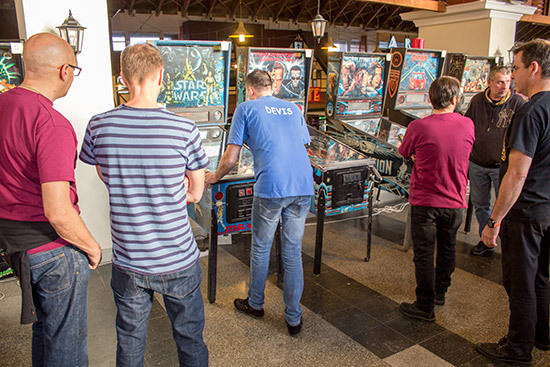 While qualifying for the main RPO tournament was taking place, players could also compete in the '80s Tournament which was held on five machines at the opposite end to the tournament desk. 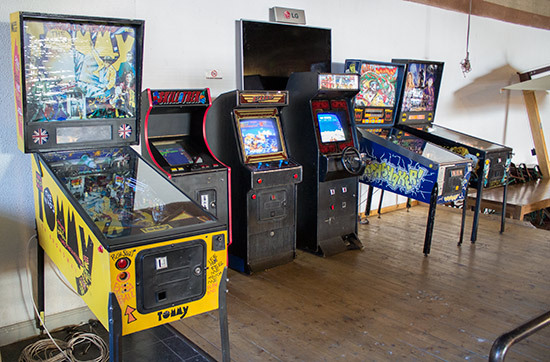 Entry to the '80s Tournament got you two concurrent games on each of Road Kings, Dr. Dude, Tiger Rag, Clown and Elvira & the Party Monsters. 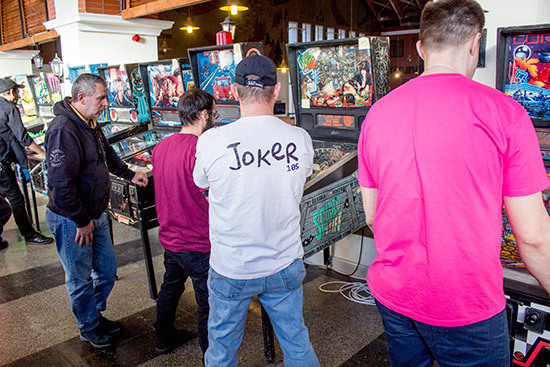 The higher of the two scores was recorded and ranked against all the other scores on the machines. 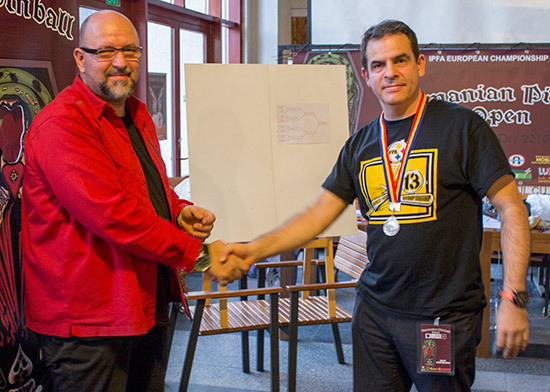 It was originally planned that the top eight players would qualify for the play-offs, but that was expanded to the top sixteen. They were split into four groups of four who played a single game per group, with the top two players continuing to the semi-finals. 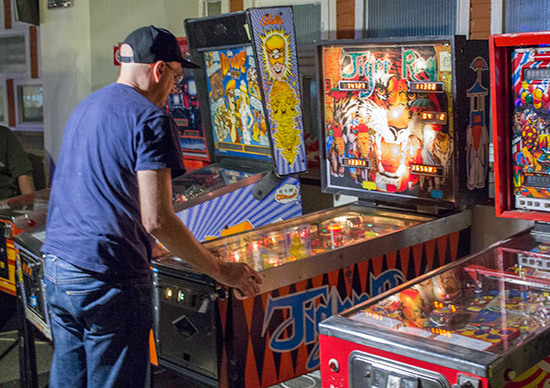 The semi-finals were made up of four head-to-head sudden-death games. 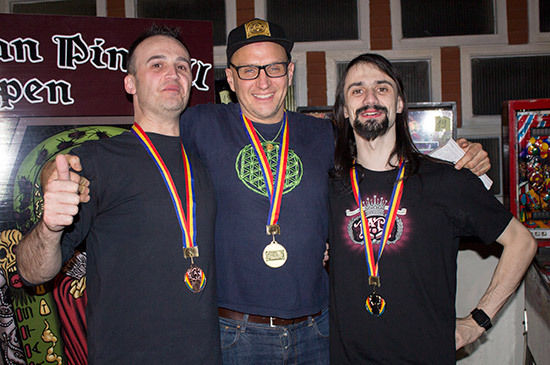 The winners went into the finals while the losers were out. 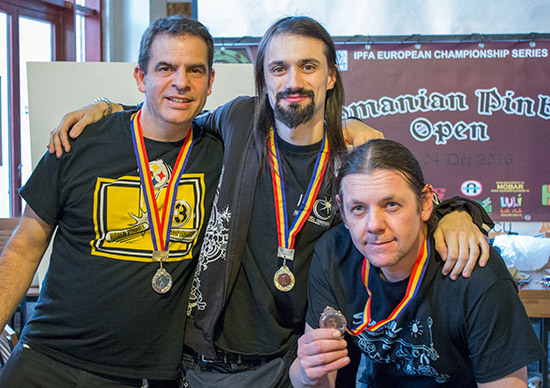 The four finalists were Bogdan Constantin Ghiga, Devis Pierantozzi, Rich Mallett and Roberto Pedroni, and the game chosen for the final was Tiger Rag which had been set to five ball play. After the first two balls, Roberto had a good lead with his 196K more than double the second place 74K from Devis. Rich was close behind on 63K while Bogdan hadn't had much luck with his 11K. 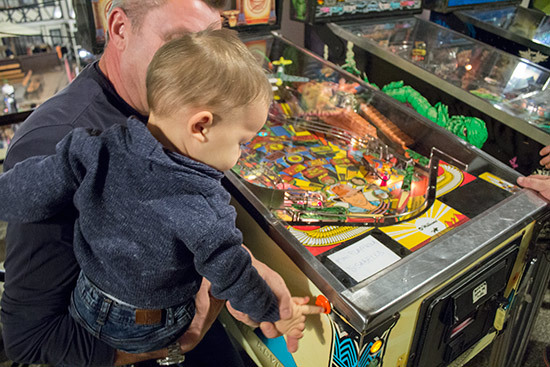 The third ball didn't change either the order or the gaps between the scores, but there was a moment of interest when a stuck ball resulted in Devis having to tilt the game to free it, since opening the coin door would have depowered the game. Devis would be allowed to play another ball at the end of the final, with the points earned added to his total from this game. While ball three didn't alter much, the fourth ball was game changer, as Rich shot from third with 73K into first place with 286K, ahead of Roberto's 240K which had seemed pretty safe. Devis could only manage a fifth ball total of 177K which gave him third place at the moment with his additional ball still to play, while Bogdan's 63K was a guaranteed fourth. Rich, meanwhile, had another good ball and ended his game with 344K, more than 100K ahead of Roberto. Could Roberto stage a last ball comeback? It wasn't a lucky fifth ball for Roberto, as he ended his final with 274K, some 70K behind Rich. Devis would need to double his score to take the win. As it turned out, he managed 50K on his additional ball - not enough to move him up from third place - meaning Rich had won with Roberto in second. With the competitive events finished for the day, it was time for a group photograph of everyone still remaining at the RPO before we headed back to bed in preparation for Sunday's Pingolf Tournament. After the late finish the previous night, the Pingolf by the Lake tournament understandably got off to a slow start. But by mid-morning the machines were in full swing. 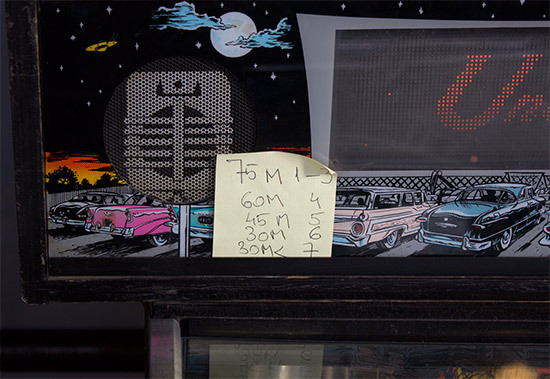 As is now common, each machine (or 'hole') had a target score posted which players had to reach in as few balls as possible. If they reached the target then the number of balls used became their score for that hole. If they didn't reach the target with the three balls allowed, they received a higher score depending on how close they were. So a three-ball score of 35M would result in a six-stroke score for that hole. 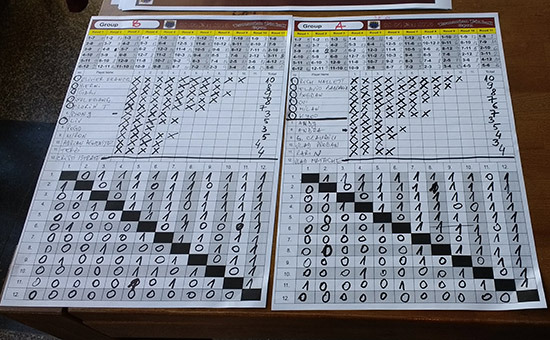 Scores were recorded on paper and entered into a spreadsheet later. The eight players with the lowest course totals then moved on to the quarter-finals where they were paired-up for head-to-head pingolf play. 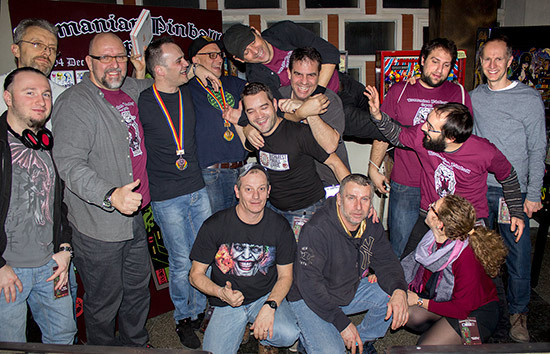 The eight were Roberto Pedroni, Gábor Vanderer, János Sándor, Tamas Odler, Devis Pierantozzi, David Mainwaring, Daniel Nowak and Daniele Baldan. 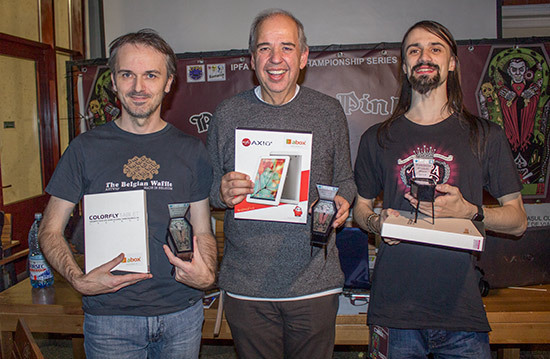 The winners from the quarter-finals were Roberto, Tamas, David and Daniel. 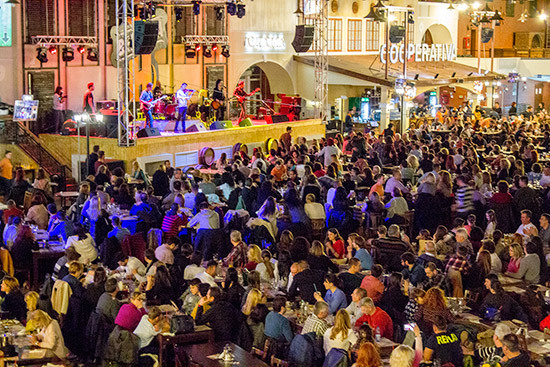 They were serenaded in the semi-finals by a traditional Romanian band who were playing to a small audience enjoying their lunch. 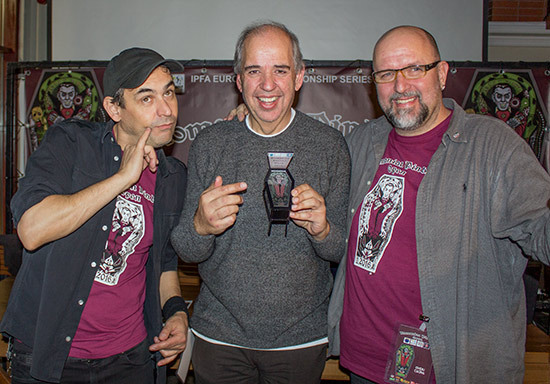 Roberto and David made it through the semi-finals to play against each other in the Pingolf by the Lake final which was played on Shrek. If either player could reach the target using fewer balls than the other then they would win. 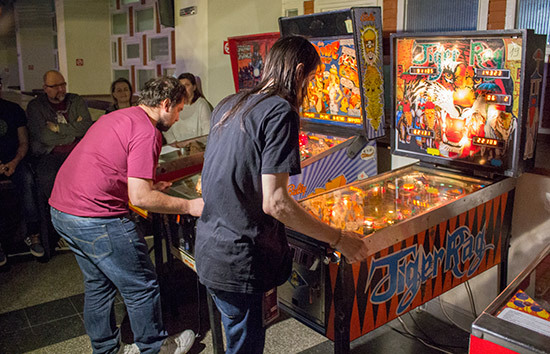 If not, the finalists moved on to a different machine. 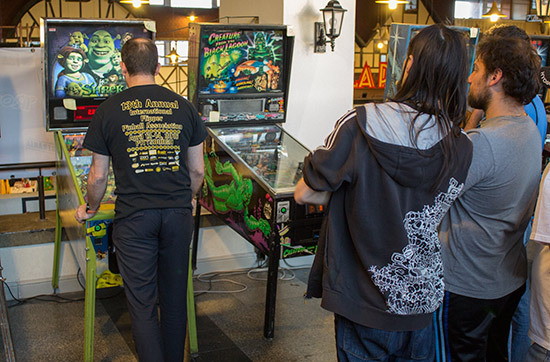 David got tantalisingly close to winning on Shrek, really needing just one shot up the ramp to score 800K and reach the target. As it turned out, that shot rebounded down the right outlane, resulting in a tie. So the pair moved on to Star Wars. 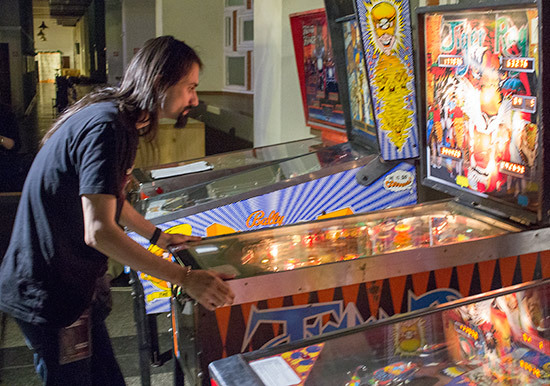 Roberto's strategy of looping the ramp shot - this game was on original ROMs, not the newer code - allowed him to build up a healthy score and quickly reach the target. 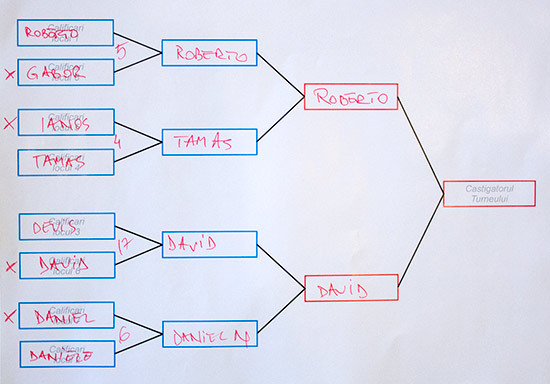 David tried to follow suit but, although he got close, he couldn't replicate Roberto's accuracy on the ramp shot, meaning Roberto won the game and the final. 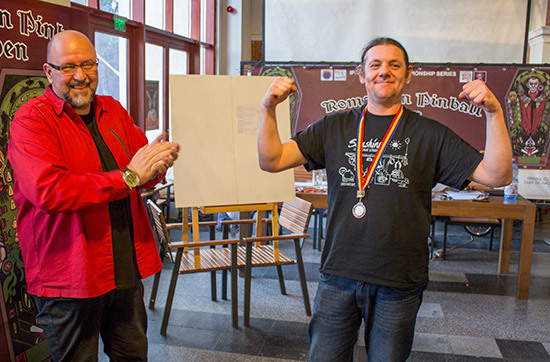 The third place play-off between Daniel and Tamas resulted in Daniel taking third and Tamas fourth. Then it was time for the presentation of medals for the top three Pingolfers. 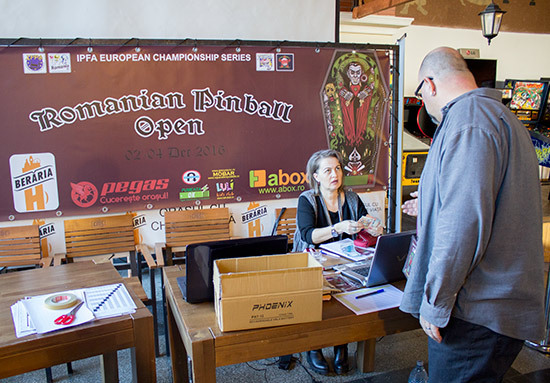 With the Pingolf completed, the machines were opened up for free play and the Romanian Pinball Open officially came to an end for 2016. Anyone want to be Dracula? Gabby says he'll bite! 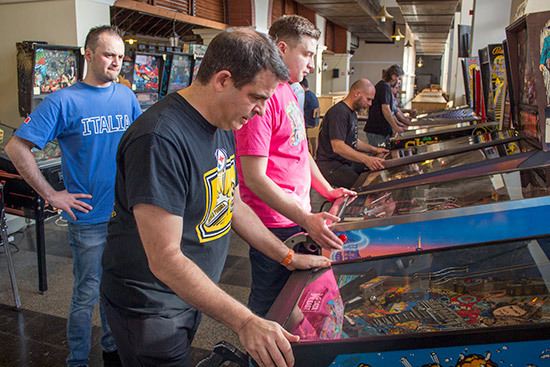 The RPO was a good-natured and enjoyable tournament weekend. 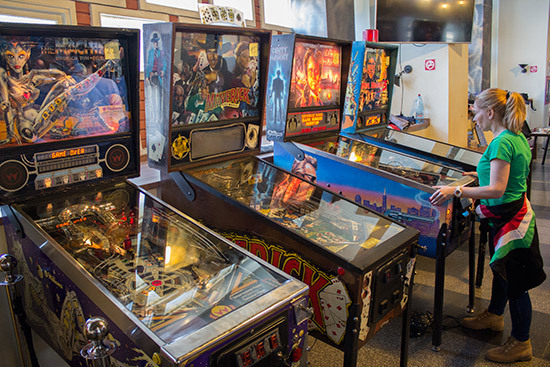 The venue is certainly impressive and unlike any other tournament setting we have experienced. The volume of the live music both during warm-up and the actual performances took some getting used to at times, but having decent food and drink so readily available was much appreciated. 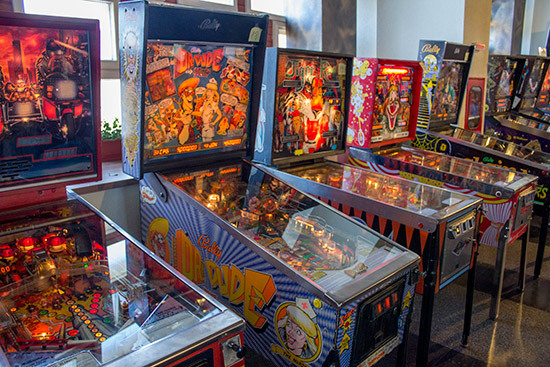 The condition of the machines used was less attractive. 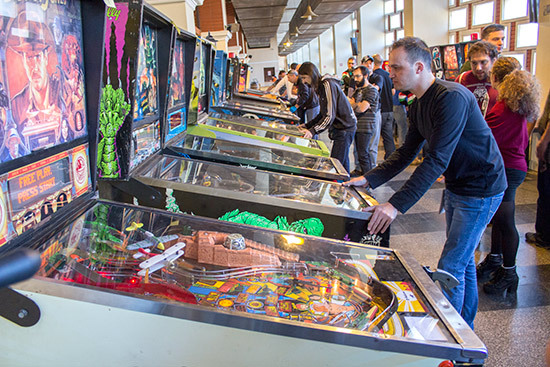 Some had obvious faults which either took them out of the tournament or needed player cooperation to work around, and there were few opportunities to fix them once the tournaments began. 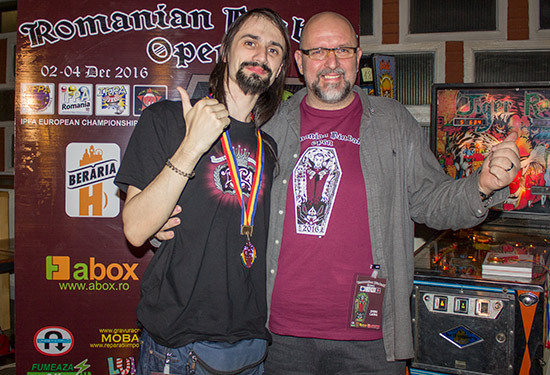 But bringing together more than two dozen pinballs and holding an international tournament weekend is not a small achievement in Romania, so everyone appreciated Ovi's hard work and seemed happy to play the games as they found them - 'street pinball'. 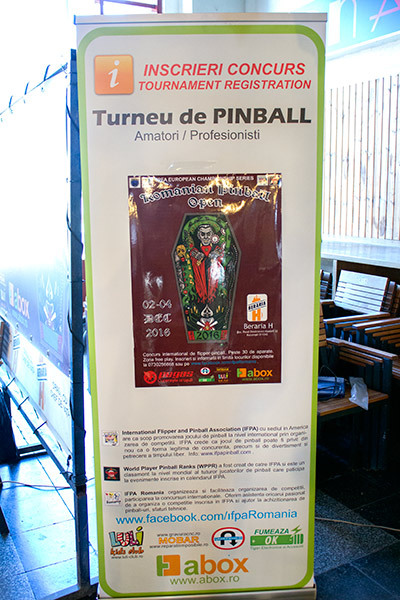 We thoroughly enjoyed both the pinball and the city of Bucharest, and look forward to returning next year to experience much more of both.